Who are the Out of the Blue Singers? We joined OOTB to sing. We stay because of the friendships. And the singing. We started as strangers and now we’re best friends. OOTB is a group of women of different ages and backgrounds and interests. We may never have met if it weren’t for this shared love of singing. At rehearsals we work hard to learn and improve songs and to build performances from the notes written on our music. We love the challenge of producing perfect harmonies and bringing the songs on the paper to life. Out of the Blue Singers formed in Wollongong in 2001. Rose McGee was the musical director. From the beginning, we set out to be a different style of choir. At the same time, we made preparations to join Region 34 of Sweet Adelines International. OOTB first “competed” in a Sweet Adelines contest in Wollongong in 2002 where we performed for evaluation only. Roughly one quarter of that group are still members of OOTB. We were successful and in March 2004 we chartered as a Sweet Adelines chorus. We very much enjoyed our involvement in Sweet Adelines, valuing the excellent education and opportunities for coaching offered by the organisation. We competed in seven Sweet Adelines contests and enjoyed the excitement and the glamour. Even the false eyelashes. Rose was directing a men’s chorus on the Gold Coast. Eventually the commute became too much for her and she left OOTB in 2005. The following year we competed in Brisbane under the direction of Jan Gervais, while we searched for a new permanent director. In 2007, two of the section leaders, Vonny Winning and Janette Green, joined forces as co-directors and they have remained in this role until the present day. 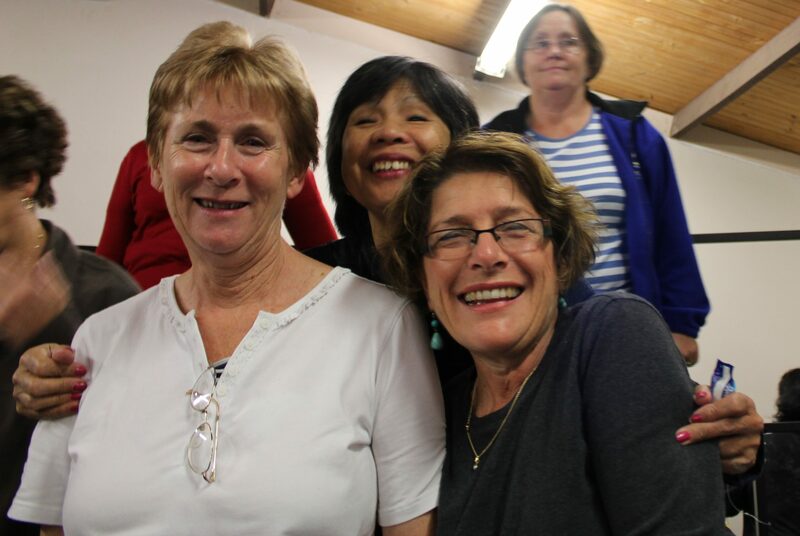 While we had benefited in many ways from being a Sweet Adelines chorus and had made many friends within the organisation, in 2016 we decided to head in a different direction, as had been a goal of the choir since its very beginnings. We completed the full circle with the 2016 contest in Wollongong being our last. We competed in the newly instituted Open Division. Throughout our life we have enthusiastically embraced involvement in our community. We have sung at fund raising events, festivals, for community organisations and we have written and performed our own shows. Our repertoire has been rich and varied. And it seems this will all continue long into the future.